The UW Bothell campus is built on what used to be the Truly Ranch and hosts 62 acres of protected wetlands. You can read more about the UWB Wetlands and restoration here: http://www.uwb.edu/wetlands/restoration. This facilitates the teaching of the course Wetlands and Our Watershed and yet, it also offers a conundrum because we are learning about restoration while attending school in an area that perhaps, ideologically – should not have been utilized for a college campus. But that is a longer conversation. This post will focus on foam; and not the kind you find in a tasty beverage, but rather that which is found in a stream. I mentioned that curiosity fuels the “art of science.” With so much information at our fingertips, curiosity is quickly fed. Hopefully this does not mean people will stop searching for their own answers since it is so easy to Google information. For our first Saturday class we went for a walk in the UW Bothell wetlands. 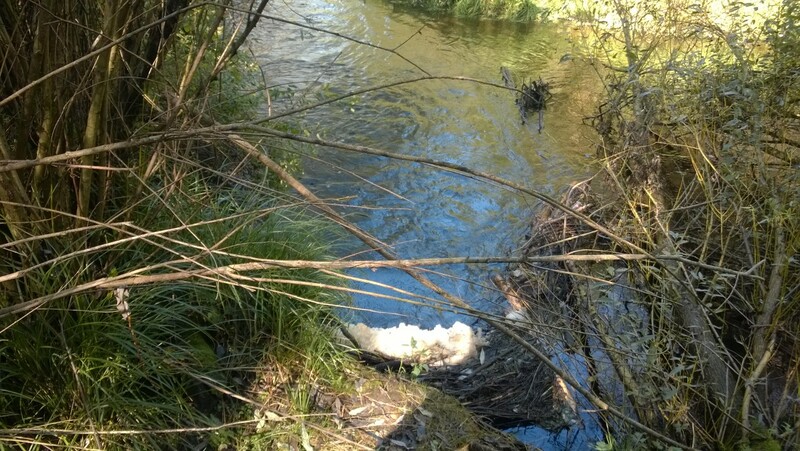 I saw a two forked creek with foam gathering in a spot near some lodged branches. My first thought was that foam was related to pollution. However, since I saw this occurrence in a protected area – the UW Bothell North Creek Wetlands, and because I have seen foam in other remote locations, I wondered if this was a natural phenomenon and what caused it. I did a quick Google search and found that foam is often a natural occurrence in streams. According to Davis (2014) foam is created when plants break then mix with water and rise to the surface creating surfactants. When surfactants meet wind by being propelled against a log jam or at the base of a waterfall, foam is created. Davis also mentions that surfactants also provide convenient transport for bugs in a stream [which in turn, may attract and feed fish]. For more information, check out the ARRI website here. This entry was posted in WOSK and tagged Wetlands on October 2, 2014 by katie64seattle.